And you know that if Google doesn’t know, then neither does anyone else. I actually took this in December 2009 – on the night of the draw for the World Cup in South Africa, after a busy night on Long Street. With the World Cup “kicking off” in Brazil this evening, everyone is going all misty-eyed over those Halcyon days in 2010 when we enjoyed Philip’s visit here. 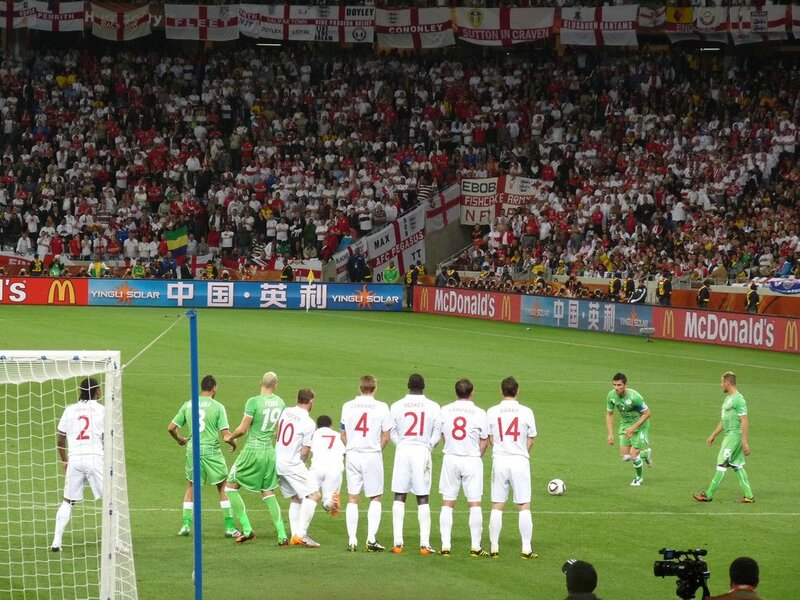 I’ve chosen to mark my memories with a photo of a free kick from the worst game I think I’ve seen since moving to South Africa – England’s bore draw with Algeria at Cape Town Stadium. England’s chances this year seem slim (not like in 2010, when they had a superb qualifying campaign), but perhaps because of that, they find themselves free of the weight of expectation. Or rather they did. Up until about two weeks ago, everyone back in Blighty had completely accepted that this wasn’t a tournament in which England were going to go far; expectation – traditionally an albatross around the teams’ collective necks – was at an all time low and that was a Good Thing. Without the fans’ expectations on their minds, England could actually do quite well in Brazil. This in itself, raised expectations and thus was a self-defeating prophecy. But then again, maybe if people see that the low expectations of success have raised the expectations of success, and that that approach will, in turn, increase the pressure on the team and thus lower the expectation that they will do well, maybe they will do well. Not that I want to raise expectations of that. Carlos Botella, head groundsman for the Royal Verd company which is responsible for the turf at Manaus and six other World Cup stadiums, has conceded that the game on Saturday, which will take place in severe heat and humidity, will be played out on a desperately inadequate surface. No worries, Carlos. You’ve only had several years to prepare, so yes, get that emergency plan into operation 72 hours ahead of the first game. We’d been playing football and rugby in our stadiums 4 months before the 2010 World Cup got started. Worryingly, while I’m looking forward to having some footy back on the TV, I’m rather unexcited about the whole World Cup. Maybe it’s the time difference. Maybe it’s the fact that last time around was Just So Good. I just hope that I can get into it soon. I’d hate to not enjoy the whole 4 weeks. Author 6000Posted on June 12, 2014 June 18, 2014 Categories in the news, positive thoughts, sport, this is south africa, world cup 2010Tags brazil2014, england, hysterical press, world cup 20104 Comments on Remember 2010…? Weren’t we lucky in 2010? Can you remember all that time ago, back to those Halcyon days of Portugal v North Korea, France v Paraguay and no load-shedding? June 11th to July 11th 2010 was one of the finest months South Africa has ever had. No crime, seamless organisation and an amazing advert for the country in front of a worldwide audience. It’s a disaster. The country is a laughing stock and… and… well, look, it’s just a disaster, isn’t it? But it didn’t happen. Despite the fact that we’ve long had power woes – 2008 in particular stands out as being load-shedtastic – we made it through that month with not even a flickering hint of a blackout. How? You almost want his third name to be Jacob, don’t you? Just as long as his fourth one isn’t Julius. And, given the global audience and the hugely damaging effects of a power outage in any of the 64 World Cup games would have had, I think he probably deserves it. Cough up out of your phat R12.24 billion profit for the six months to September 2013, please Eskom. Give the man his money. But before Nelson disappears off back to the North West province to buy heaps of precious metals with his newly-gained moola, just let’s hold on a bit. Because with great power (and let’s face it, getting God to help Eskom out of tight spot is great power), comes great responsibility. And that’s where I think Nelson has let us all down. How could we forget the infamous fake sign language interpreter at the Nelson Mandela Memorial service held at…wow… Soccer City, just last month? Yes, with (potentially even more of the) world’s eyes on us again, on the big stage – the biggest stage – we were internationally embarrassed. What an absolute shambles it was, start to finish. There were pieces in Time magazine, Sky News, the BBC and, Oh Sweet Jesus, even the Daily Mail – LIKE THEY NEED ANY MORE AMMUNITION?!?!?!?!???1!! Nelson. Oh, Nelson (no, not that one, this one)… You could have prayed and you could have prevented this burden and humiliation of the fake sign language interpreter. You had the power to do this, Nelson, and yet you chose not to? Why would you expose us all to this ridicule, Nelson? You have let the country down, and we deserve and demand compensation. Perhaps unsurprisingly for the purposes of this blog post, I feel that about R250,000,000 should see us suitably placated. And now we know what you are capable of – and we freely admit that the whole Eskom thing was a truly remarkable effort, Nelson – I’ll give you until the end of February to have a word upstairs and get rid of that terrible Zuma bloke. Otherwise, I expect to see your cheque book out again. I hope we’re clear on things now, Nelson. Author 6000Posted on January 23, 2014 January 23, 2014 Categories annoying people, economic issues, elections, in the news, no electricity, that's a bit mad, this is south africa, world cup 2010Tags Eskom, loadshedding, nelson thabo modupe, ridicule, world cup 2010Leave a comment on Weren’t we lucky in 2010? Here’s a funny thing about the African Cup of Nations. There are no Europeans trying to tell the organisers what to do. Nobody signing petitions to try to ban fans from blowing vuvuzelas. Nobody telling the mamas who sell pap and fried chicken outside games they can’t come within five miles of the stadium. Nobody telling supporters who earn £1 or £2 a day they have to pay £40 a pop for a ticket. AFCON 2013 is way better for it, too. It’s like the World Cup in 2010 would have been before Fifa de-Africanised it. It’s full of life, vigour and colour, the slow drum sway of Nigeria fans, the choreographed vuvuzela-moves of Burkina Faso fans, the delirious joy of the Ethiopians. It is a celebration of football, of course, and the match between holders Zambia and minnows Ethiopia in Nelspruit on Monday was full of exquisite skill and great drama. 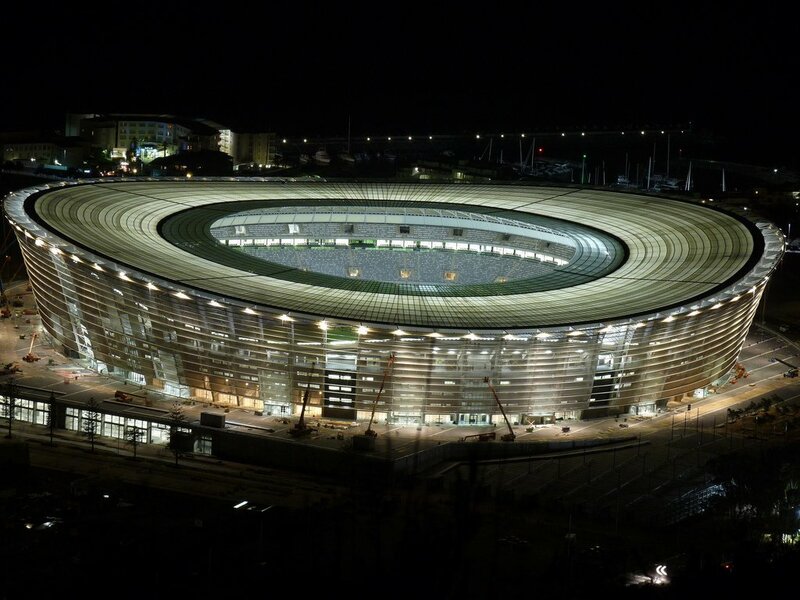 But it is also a celebration of South Africa, a showcase for the legacy of hosting the World Cup. The vuvuzela is part of the African football experience. I’m sorry you don’t like it. But what you like is not of interest to me right now – you want a World Cup in Africa, then have an African World Cup. The legacy of the 2010 World Cup is everywhere in South Africa. It just depends whether you want to see it or not. The Manchester City forward is often regarded as being one of football’s bad boys, but off the pitch there is a very different side to him. Few know… that Bellamy has put hundreds of thousands of pounds into his West African academy, has spent two weeks in Sierra Leone during the past three summers and is well versed in the continent’s history and politics. There has always been far more to this Welsh firebrand, who physically and verbally confronted a Manchester United supporter on the pitch at the end of last Sunday’s Old Trafford derby, than his ‘Mr Angry’ caricature suggests. His apparent compulsion to venture where others fear to tread is not always misplaced. Statistics, anecdotes and research suggest that touring the Rainbow nation as a fan next summer could be a dangerous option. In fact, the 2010 World Cup should have gone to Egypt. surely if the Egyptians could build the pyramids they could host a World Cup. Moreover, staging football’s biggest and best event in a key centre of the Arab world might just have helped ease tensions between the international Muslim community and the west while simultaneously weakening the Islamic fundamentalists growing hold over hearts and minds. *cough* Quality predictive journalism, right there. So Louise, I hope that based on your track record you’ll excuse my reluctance to take your ramblings seriously. I’d love it if Craig Bellamy and his Academy was doing wonderful work in Sierra Leone, but I’ll wait until I see some evidence of it elsewhere before I actually believe it. Still, if we’re looking for alternative precariously-positioned and potentially risky nations for Craig to further pursue his altruism, perhaps I might be so brave as to suggest… er… Egypt? Tonight, I will mainly be watching Poland v England. It’s a game that both head and heart agree England should win. Sadly, both head and heart have had those feeling before and been sorely disappointed.